To teach your dog tricks even easy ones you need to have some kind of a treats for the reward, be in a quiet suitable place and keep the training sessions to 15 – 20 minutes or your dog will start to get bored. Remember, when he gets something right lots of praise and a reward treat. You just have to be careful not to get him over excited or he will loose concentration. First get your dog to sit, then as you say the word ‘paw’ take your dog’s paw in your hand, give the dog a treat. Repeat this. After a few times try not to take his paw so quickly, say the word, count a few seconds and then take it. You should notice he is bringing his paw up as you say the word. If he does not, go back to saying it at the same time. Do it a few more times then slow your response again. After 2 or 3 sessions most dogs pick this one up quite happily. Like a lot of tricks, the high five is a progression of an earlier trick, in this case the paw trick. Hold a treat in your fingers and raise your hand slightly higher than you would for the paw trick. 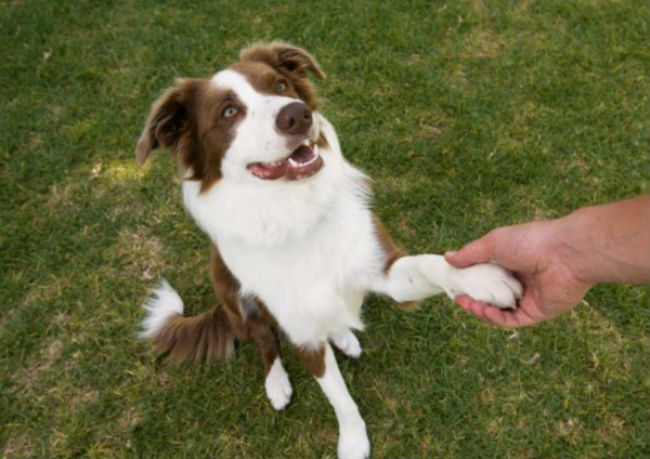 Your dog will think you want to do the paw trick and will reach for the treat with his paw as we taught him earlier. As he reaches up you say “high five” and give him the treat. Once your dog has mastered the paw trick this one should be very easy to learn and with just a few sessions he will be doing it on hand signal rather than voice control. If it doesn’t go as expected, keep practicing until he makes it. Before you start this one I would just like to ask you to be sensible and not hold the hoop too high as you do not want your dog to hurt himself while doing the trick. Sit your dog on one side of a hula-hoop. Get the dogs attention on your hand on the other side of the hoop. Take a treat in your hand and give the dog the command to release him from the sit. At first, he may attempt to go around or under the hoop. If this happens just start again. Your dog wants the treat and will soon learn that going under or around does not get it, so he will start going through it. When he does, shoot out “hoopla” and give him some treat. He will soon be jumping through the hoop on the command of “hoopla” just be patient. When I started doing this trick, I had a medium sized Lab, so I started with the hoop 7 inches from the ground and slowly raised it to waist height. 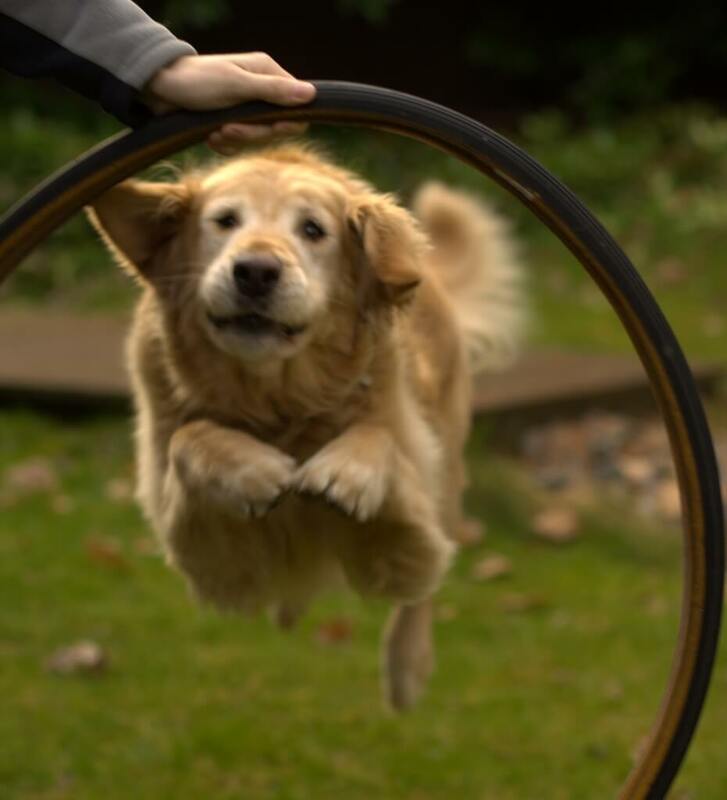 If you have a smaller dog, you might want to start with the hoop touching the ground, so the dog just goes through the hoop and then slowly raise it as he gets used to the trick. Good luck and don’t forget to leave your comment!